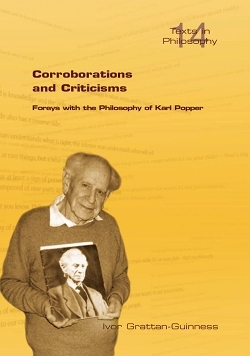 This book contains around a score of essays that examine or use Popper�s fallibilist philosophy of science from various points of view. The opening sextet includes a new solution of the problem of induction, the status of corroboration, and the place of truth-values and logic(s). Then follow a trio of studies of relationships with some other philosophies, especially Bertrand Russell�s. Next come five essays on the history and historiography of science and mathematics, and of mathematics education. They are followed by a quintet of speculations relating to aspects of psychology, especially psychical research, coincidences and the formation of languages in humans. Finally come two new items: one on the philosophy of mathematics, the other a public acknowledgement of the influence of Popper in August 2009 when the Internatioal Commission on the History of Mathematics awarded Grattan-Guinness the Kenneth O. May Medal and Prize in the History of Mathematics. I. Grattan-Guinness is Emeritus Professor of the History of Mathematics and Logic at Middlesex University, England, and also a Visiting Research Associate in the Centre for Philosophy of Natural and Social Science at the London School of Economics.